Universal app support to take advantage of entire iPad screen. Other minor improvements. Please download our most popular game, Card Counter, which is based on Blackjack card counting! Blackjack Basic Strategy Card is a quick interactive guide for playing Blackjack. Need to know what to do in any hand? This is the app for you. 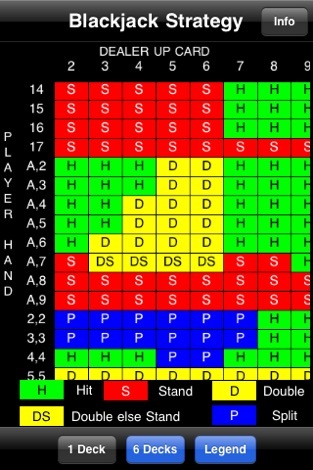 Get ready for the casino tables by studying if you should hit, stand, double down, or split. If you enjoy this application please check out our most popular game, Card Counter, that is fun to play and based on actually Blackjack card counting techniques. Simply makes a map (image) of your current location and emails it to someone. You can position the map and adjust the zoom as needed. Simple and effective way to answer the question: Where are you? KISS design makes super easy to use.